Tulips bulbs are sold as perennials for the flower garden, and some even make the promise of forming a handsome naturalized colony in your landscape. So why did your tulips only put out a few miniaturized flowers this year, compared to the vivid show they put on last season? Follow these eight steps to making your investment in tulip bulbs pay off year after year. Species tulips may not be as large or showy as some of the hybrids, but their hardiness and tendency to perennialize makes them a desirable addition to the spring flower garden. Many species tulips have more narrow petals and a star shape that distinguishes them from the typical urn shape of the hybrids, but the red and orange flowers of Tulipa wedenskyi ‘Tangerine Beauty’ display an urn shape. You can also try the Kaufmanniana hybrids for better perennializing. Like many garden flowers, tulips thrive in rich soil with good drainage. Planting tulips in heavy soil that has a high clay content often leads to rot, as these soils remain wet during the spring thaw period. The best time to amend the soil is before planting. Dig compost, manure, and rotted leaves deeply into the soil. If your bulbs are already planted and you don't want to disturb them, it's never too late to improve the soil: Add a three to four-inch layer of compost on the surface of the garden bed, and let earthworms do the rest. Their tunneling action will help air circulation and improve soil tilth. Most tulips need a period of cold dormancy each winter to trigger blooming. Many tulips perennialize best in zones 7 or cooler, but preferably in zones 6 or cooler. A notable exception is the species Tulipa saxatilis, a Crete native that may grow in zones 5-10. If you live in a warm area and yearn for tulips, your best bet is to force them indoors by precooling them in the refrigerator for three months in containers. Horticulturists recommend any of the Emperor tulips for forcing. Expect blooms about three weeks after the chilling period. Tulip bulbs need a certain planting depth to keep them in dormancy for the proper amount of time, to protect them from frost heave, and to keep them from drying out. Plant the smaller species tulips at least four inches deep, and plant the larger hybrid tulips at least six inches deep. If you aren’t digging deeply enough because you can’t penetrate all that clay soil, fix this soil issue before planting. 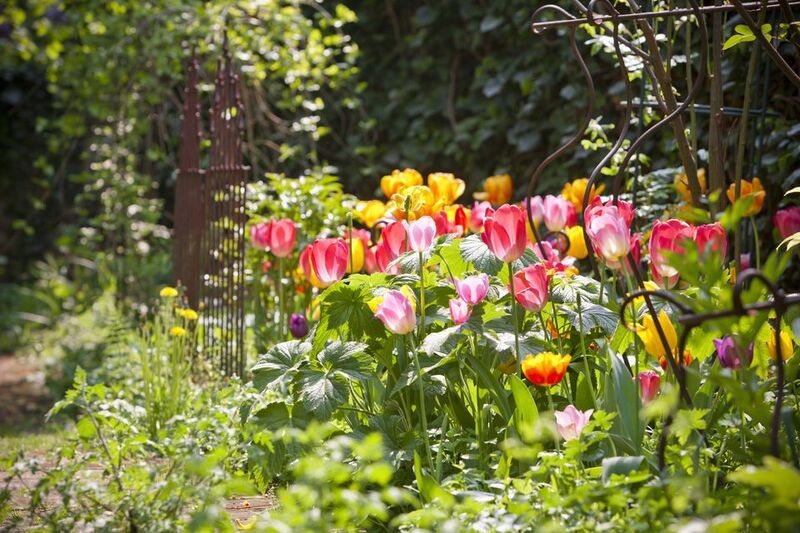 A dappled shade garden is fine for tulips, and may even extend the blooming time, but the dense under story of a tree canopy is no place for tulips to perennialize. The bulbs will suffer as they compete with tree roots for nutrients, and the foliage will not be able to conduct enough photosynthesis to nourish the bulbs for next year’s blooms. If you plant your tulips under deciduous trees, choose the earliest blooming varieties like the Fosteriana types so that they have more time in the sun before the trees leaf out. Rodents find tulip bulbs a delicacy, especially as winter approaches and other food items become scarce. At planting time, take care not to leave the papery bulb covers lying around the planting area, as this tells rodents, “There’s a snack nearby!” Keep a nearby squirrel feeder stocked until the ground is safely frozen. You can also plant tulip bulbs in specially made protective wire cages to deny pests access to bulbs. Many gardeners are good about applying bone meal at planting time in the fall, but this only takes care of the developing roots emerging from the tulip bulbs. You should fertilize again when the sprouts emerge to feed the leaves and flowers, and in midsummer when the foliage dies back to feed the bulb once again. An application of balanced fertilizer in autumn completes the fertilizing cycle. Bone meal isn't a requirement as any flower fertilizer will do; a ratio of 10-10-10 of nitrogen, phosphate, and potash will nourish all of the spring-blooming bulbs in your garden. Tulip plants will waste precious energy making seeds after the petals fall away; this energy should be directed into the bulb and next year’s flowers. Cut the spent blooms at the base of the stem as soon as the blossoms fade. The exception to this is with species tulips: you want these to produce seeds, so they can spread and form an attractive grouping in your garden. Perhaps we’ve almost overcome the silly practice of braiding bulb foliage or tying it back. We must also resist cutting tulip foliage to the ground, no matter how shabby it looks after the blooms are gone. This means you can’t plant tulips in your lawn, unless you plan to enjoy them for only one season, or unless you strive to grow a meadow. After the foliage browns, usually in midsummer, you can remove it. It’s also fine to let it lie in place, and decompose in situ, providing a bit of food and forage for the earthworms beneath.